I love making dumplings almost as much as I love eating them. Luckily, W loves them too - we relish what we call our dumpling dinners at least once a fortnight, be they toasty pan-fried pot-stickers like gyōza or guo tie, or soup dumplings, or wontons floating in clear broth. And after finally figuring out how to rustle up a few basic dumpling wrapper doughs, the process has become one that affords as much therapy as it does good eating. I'd been meaning to get round to posting about the simple hot water dough that's used for potstickers, but never quite got my act together enough to take a few making-of snaps, which are probably more functional than any length of explanatory column inches - it's definitely one of those things that sounds trickier in writing than the doing actually is. Store-bought wrappers, it goes without saying, can be used for the gyōza stuffing below, making for an extremely quick yet tasty supper to throw together. 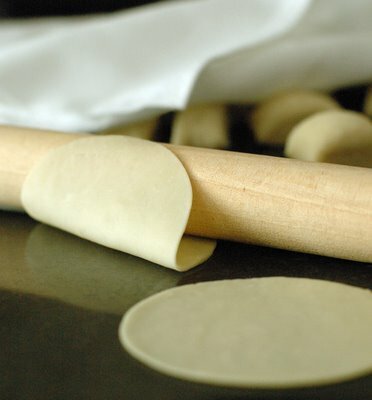 But being manufactured from a cold water dough, they will not have that distinct taste and texture - a toothsome resilience and subtly glutinous quality - characterictic and beloved of tang mian (hot water dough). Also, once accustomed to how seductively supple and pliant to the touch this well-behaved dough is, how it's soft and moist enough to seal unto itself without need for a wet finger run round the rim, how the finished dumpling is as seamless as a fine Hanro chemise, it'll be hard to go back to off-the-shelf. The recipe below makes 32 dumplings, which generously feeds four. Or you could cook some for two, and freeze the rest (uncooked) for later. Inspired by a recipe in Elizabeth Andoh's wonderful book, Washoku. Many variations for this pork and cabbage stuffing abound - I particularly like this one for its inclusion of leek, carrot and wakamé, which really heighten the natural sweetness of the pork. 1. Soak the wakamé in water till softened. Drain, pat dry, mince, and set aside in a large mixing bowl. Toss the cabbage with salt. Let sit for 10 minutes to draw out moisture. Drain, squeeze dry, and add cabbage to the bowl. Add leek and carrot to bowl. Stir to combine. Add ground pork. Stir to combine. 2. In a small bowl, combine all the other ingredients. 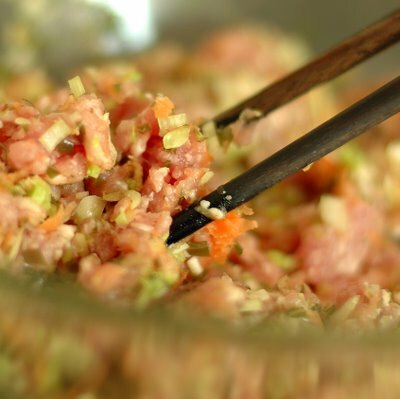 Add this seasoning liquid to the pork mixture gradually, stirring all the while to ensure the stuffing is evenly mixed. You will end up with a fairly loose, moist mass. Press clingwrap directly to the surface of the mixture. For the best flavour, let sit at room temperature for 30 minutes, or store immediately in the fridge (it can keep overnight), before using. I find the saucer-shaped Japanese ceramic grater with a raised central platform of spikes (thus ingeniously creating a moat for collecting the juices of whatever you're grating) the most efficient implement for dealing with ginger, be it juice or grated ginger (the spikes also help catch tough fibres) that's needed for a recipe - I couldn't live without my Kyocera grater, which also has a thoughtful non-slip rubberized rim on the bottom. I first came across tang mian in Fuchsia Dunlop's Sichuan Cookery (which incidentally has a collection of fantastic Sichuanese dumpling recipes - steamed, boiled, pan-fried, you name it - if you're interested), and liked it so much I have used this hot water dough for potsticker-style dumplings ever since. There's a similar recipe to be found in Hiroko Shimbo's The Japanese Kitchen. 1. Combine the flour and salt in a large mixing bowl. Make a well in the centre. Bring water to the boil. Remove from heat. Once it stops bubbling, immediately pour onto the flour. Mix vigorously and quickly with a large fork. 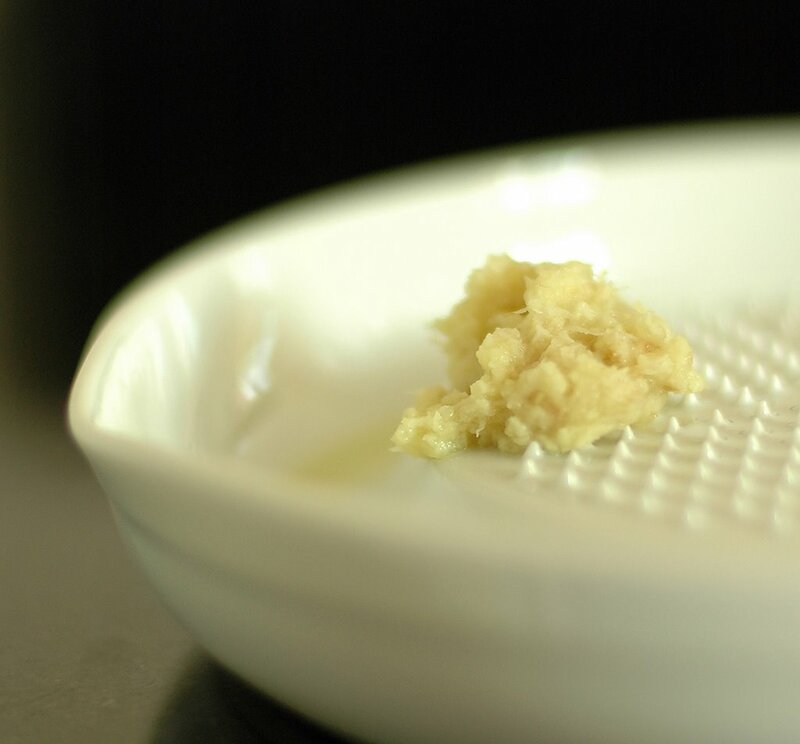 When the mixture is cool enough to handle (but still warm), transfer it to your work surface and knead for 5 to 10 minutes to a perfectly smooth dough. The dough should feel soft and pliant, but not tacky. When lightly pressed with your finger, the dough will bounce gently back. 2. Very lightly flour the work surface if necessary - dough of the correct consistency needs little or no additional flour; only flour the surface if the dough is sticking. Divide dough into four pieces. Roll each piece out into a sausage-like rope. Divide each rope into eight pieces. Each piece (there’re 32 in total) makes one wrapper. Whilst proceeding, cover the pieces you aren’t working on with a clean, wet-then-wrung dish towel to prevent the dough from drying out. Verticalization of the production process (roll out all the pieces, stamp out all the circles for wrappers, fill all the circles, shape all the dumplings) may seem like a good idea - and probably is, if you’re very speedy or there's more than one pair of hands in the kitchen –until you have the dough drying out on you before you’re done filling and shaping. So it’s probably a more prudent idea to break it up (roll, stamp, fill and shape the first group of wrappers before you roll out another group of dough pieces – about four to eight pieces at a go is manageable, depending once again on your speed). If using store-bought wrappers, simply skip straight to step 2. and proceed with filling and shaping, but you'll need to slightly moisten the edges of the wrappers with water to seal the dumplings. 1. Line a baking sheet with non-stick parchment to hold the finished dumplings. Set aside, within arm's reach of your work surface. Flatten each of the dough pieces with the palm of your hand. Roll the flattened pieces into circles slightly larger than 6 cm in diameter. Use a 6 cm round cutter to stamp out wrappers. Discard the ragged trimmings. 2. Fill one wrapper at a time, keeping the remaining covered. Place a heaped teaspoon of stuffing into the centre of the dumpling wrapper, nudging it into a quenelle-like shape that's tapered towards the two ends of its length (this makes the dumpling easier to seal), ensuring there's a clear border of wrapper circumnavigating the stuffing. Fold the wrapper gently in half by bringing the two sides (parallel to the length of the stuffing) up over the stuffing. Pinch shut at midpoint before pleating and pressing - homemade wrappers are soft and moist so you'll have no problem sealing them. 3. Starting to the right of the midpoint, make three tidy and tiny pleats on the side of the wrapper facing you (and not on the further side), folding the pleats in the direction towards the midpoint. After each pleat, pinch the dough to join the pleat to the unpleated side of the wrapper. Pinch the extreme right corner of the arc closed. Half the dumpling has been sealed. 4. Repeat the process to the left of the midpoint. Starting to the left of the midpoint, fold the pleats in the opposite direction from before (in other words, still folding the pleats in the direction towards the midpoint). Pinch the extreme left corner closed. 5. Now gently pinch all along the elegant arc that you've created to ensure it is securely sealed, and to thin the ridge of dough. The dumpling is now completely sealed. The finished dumpling, as seen from an aerial view, is pleated on one side, smooth on the other, naturally curved into a pot-bellied crescent shape thanks to the pleating method, and sits on a flat base. The beauty of this method, aside from the beauty of the dumpling, is that the dough is not coarsely thick at the ridge, having been pleated only on one side, and the dumpling stands upright on the tray and later, in the skillet. 6. Set the first batch of dumplings aside on the lined tray; the dumplings should not touch each other. Repeat above steps with subsequent batches of dough pieces until done. Note: If not cooking the dumplings immediately, freeze them (they freeze very well) in one layer on the tray covered with clingwrap. When frozen, pack the dumplings into airtight storage boxes. They will keep, frozen, for a fortnight. 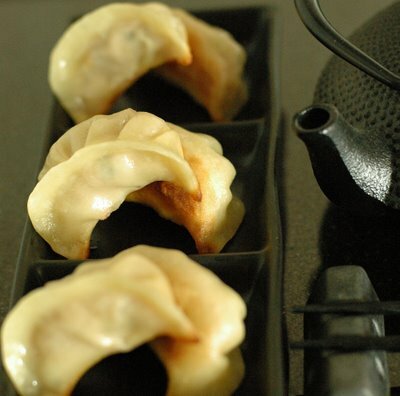 When cooking frozen dumplings, do not thaw them – cook from frozen, adding an extra minute or two to the steaming time. The potstickers are cooked by a method which part-fries, part-steams them, so they wind up juicy and succulent yet have crisp, golden bottoms - in Japanese, this type of cooking is called mushi yaki ("steam searing"). 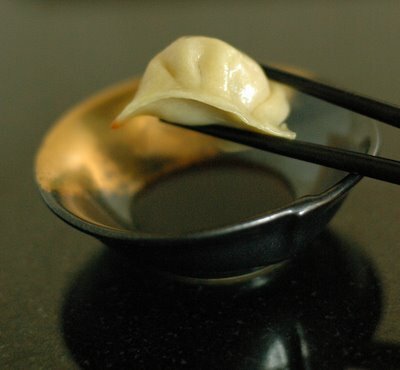 Typically, the potstickers are drizzled with water to create steam. However, I like steam-cooking them with chicken stock instead of water, which gives them extra oomph in terms of both flavour and colour - a marvellous trick I picked up from Barbara Tropp's The Modern Art of Chinese Cooking. 1. Heat a heavy skillet large enough to accommodate all the dumplings at once over a medium-high flame. Add enough groundnut oil to slick the surface amply. When the oil is properly hot, carefully line up the dumplings in the skillet, side by side in neat rows resting on their flat bottoms. Cook the dumplings for 2 to 3 minutes, or until nicely browned on the bottoms, checking the colour by carefully lifting a couple of dumplings by their pleated edge. 2. Pour in enough chicken stock to come one-third of the way up the sides of the dumplings. Be careful; the liquid will hiss, splatter and spit as soon as it hits the pan. Lower the heat to maintain a gentle simmer, and immediately cover the skillet with a lid to trap moisture and create steam. Steam for 4 to 5 minutes (6 to 7 minutes if cooking from frozen). Start checking the progress after 3 minutes; when the wrappers appear translucent, the stock is almost all absorbed, and the meat is cooked (check by prodding with chopsticks for firmness), remove the lid. 3. Drizzle the dumplings with the sesame oil. Raise the heat slightly and continue to cook at a merry simmer until all the liquid has evaporated and only the oil remains, about 2 to 3 minutes. They are done when their bottoms are crisp enough to "clink" when tapped with a fingernail. To serve, remove with a spatula and turn them upside down onto a serving plate so their golden bottoms face up. Serve without delay, accompanied by the dipping sauce (see below). 1. Stir the soy and vinegar together. 2. Distribute among individual sauce dishes. Note: If liked, add some grated ginger and/or chilli oil to taste. This is excellent Jocelyn! Like you, I love to eat them! ;-) Beautifully explained and illustrated, as usual! Your posts are so wonderful.Poetic! Plus terribly inspiring.I love them but I have never tried to make them. 1) Do you use bleached or unbleached flour for the gyoza wrappers? Do you use an extra fine flour or just regular? 2) What is groundnut oil? truly exactly and wonderfully made, photographed and explained. you're so good at sharing your talents, cooking, writing, and photographing. I know for sure, I could never get mine to look like that, sadly I'm all fingers and thumbs! Fantastic photos and writing as usual, you are such a inspiration. I found this entry and the photos quite exciting. I would love to learn how to make dumplings. I made some for a pastry practical a couple of years ago, but I'm sure they weren't as perfect as yours. I must start teaching myself how to make them. I have some dumplings my friend's mother made for me in my freezer and am afraid to eat them because then they'll be gone! But when I get some time (hopefully next week) I'll try to make some using your blog as a guide. And if I fail miserably, I'll have to fly you out so you can teach me! You bring back wonderful memories of making potstickers with my mother! The gyoza look perfectly delicious - and perfectly photographed, as usual! I never thought to make homemade wrappers, too formidable but your description sounds fairly approachable. Thank you I hope to try these. I have always wanted to make these myself, but have been too intimidated! I never even tried it with the store bought dough. These are so widely available in the frozen section now, but they are usually doughy and freezer-burned. I may have to attempt this project now. I have never seen such comprehensive and detailed instructions. Thank You! Jocelyn - they're so beautiful! What a wonderful post - you make it sound entirely doable (but I suspect getting them as perfect as yours takes a good deal of skill and experience). I'm so, so tempted to give this a try! These were truly special. You've inspired me to try my hand at making the wrappers myself too. The kurobuta was well worth the expense. Yum! Isn't that grater just a godsend? It makes grating daikon such a breeze. Wow, you're wrapping is superb. It doesn't look homemade at all. Thanks for those detailed instructions & recipes, J! Once I pick up enough courage to make these dumplings myself, then I know whom to turn to! (I have made wontons with shop-bought wonton wrappers and they weren't too bad at all, though definitely not authentic enough). Thank you for charing your technic, amaizing post, congratulations ! Gorgeous ! I have never been successful in making pleats like the one you showed. We make something similar with rice flour. Thanks for the detailed steps. Inspiring as always. I nearly bought the Elizabeth Ando book at the Kino sale, but with four other books in hand, I figured I wasn't quite ready for it yet. Now though, I just may have to go back and get it. Beautiful, as usual and you make it look so easy. J., being from good Northern Chinese stock, I absolutely adore dumplings like these. But yours are SO pretty, as is all your food... 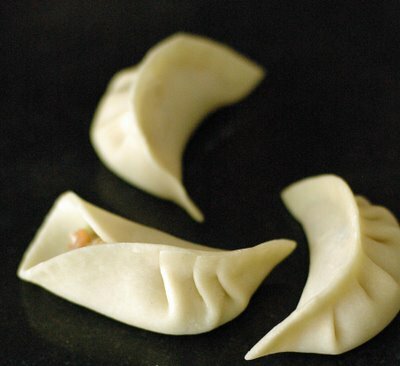 Thanks for sharing your experience, my posting on Jiaozi was not nearly as eloquent ;-). Very niiiiiiice... I will try and let you know. On Thursday I was in a Chinese restaurant here in Stockholm, a place where they only make dim sum... thay were so good! Brilliant tutorial, J. I'm still not sure I could get mine to come close to yours, but I am quite inspired to try now. What a spectacular-looking post. My gyoza tend to be somewhat more rustic in appearance and I've almost never the patience to make wrappers from scratch. But even when prepared without J's artistry, they're still delicious. I usually make a large quantity and keep them in the freezer for emergency dinners and snacks. J, your gyoza look fabulous and made me hungry immediately, even though I'm not usually fond of dumplings! By the way, will you be able to attend the food bloggers' dinner? These look just exquisite! How can one ever again eat one of those horrors that come in a box frozen after your post J? Gorgeous photos! Thanks for providing all the useful information and detail. I'm going to try them in a shrimpy style. I am impressed! I always buy my wrappers. mmmmm!!! i'm definitely craving dumplings now. your wrapper circles are of such a wonderfully symmetric shape and the photos are just gorgeous, i'm glad you waited to share. Your photos are so elegant, as are your dumplings. When I try to make kimchi madu (dumplings) the water from the kimchi and tofu weakens the wrapper. Plus my fumbly fingers turn out deformed pillows! Dipped in ample soy sauce they still taste good, just ugly. i can almost taste them. Looks wonderful and I'm sure they taste sumptious as well. I once made roasted pumpkin gyozas for christmas. I coupled those with a wild mushroom ragu one. It went well with the christmasy theme. Your gyozas look exquisite! After reading CH's and yours today, I'm homesick for some good Asian food. Love the pictures of the gyozas... keep them coming! Hi, I tried making these dumplings yesterday for a housewarming. My colleagues said that the dumplings were good, just that the skin was too thick. What would be a good measure? - and the photos and writing are amazing. Thank you so so much for taking the time to write this! Anyway thanks so much for sharing this wealth of details, nothing less would have prompted me to try something so new for me. I traslated the recipe in italian launguage and I'll try the stuffing! If i'll have a good result I'll post in my blog your recipe traslate! thank you!! i'm so excited about this post. i love, love, love dumplings and have to eat them at least once a week. my favorite place in nyc to get gyoza is sapporo in times square (49th & 7th - currently closed for renovations) but i've never found an equivalent recipe for their filling. thanks for the info! Made them tonight - very, very good. Thank you very much for posting this. My wife now speaks to me again after tasting these! Many thanks for an excellent gyouza skin recipe. 32 skins is a little thick and nice for sui-gyouza, 36-38 is just right for pan- and deep-fried. With flour on hand, I'll never go back to store-bought skins. 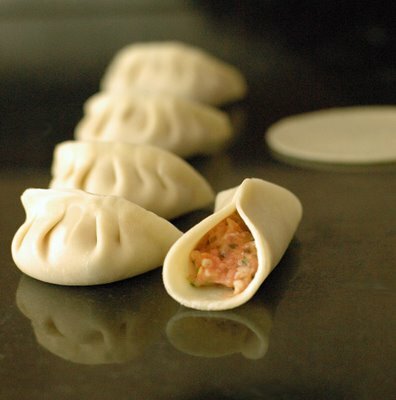 i'm finally going to try making this dough today - i can only hope to have the gyozas as perfectly folded as yours! I made these today after searching the web and finding lots of other variations. This was my first time making gyoza! It took a lot longer than I thought it would, 3 hours start to finish. The wrappers turned out thicker than I am use to, but I didn't mind that so much. The texture of the wrappers was toothsome and good! I followed the ingredient list "to a tee", weighing out the ingredients on my kitchen scale. I don't own a meat grinder so I chopped the pork to a coarse mince. I also used turkey stock ( because it's ony a few days after thanksgiving, and I had a wonderful stock on hand!) and loved using a stock instead of water. 1. The wraps only held a scant teaspoon of the filling. I ended up using the end of a chopstick to kind of tuck the filling in for the second pleating on the left side. That seemed to work. 2. I also ended up putting the filling in a colander to drain because it was SO wet, and the liquid was simply oozing out of the dumpling as I tried to close it. 3. I ended up with about a cup of extra filling, even though I made an extra 5 wraps out of the scraps from using the ring cutting tool. I would like a little more filling to wrap ratio, so next time I think I will use a larger circumference, and try to roll the dough out just a tad thinner as well. All in all a smashing success...thank you so very much for such a wonderful post!